Alien 3D 1.4 NEW! analog mode for squared and round watchfaces! 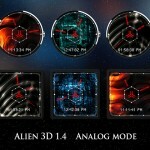 Alien 3D Watch Face is a animated 3D watch face for Android Wear devices. Works great on both rounded and squared watches. Customizable themes, colors, date format and more.